The Dutchmens Arch is located in the BLM managed area known as the Head of Sinbad about 35 miles west of Green River, Utah. 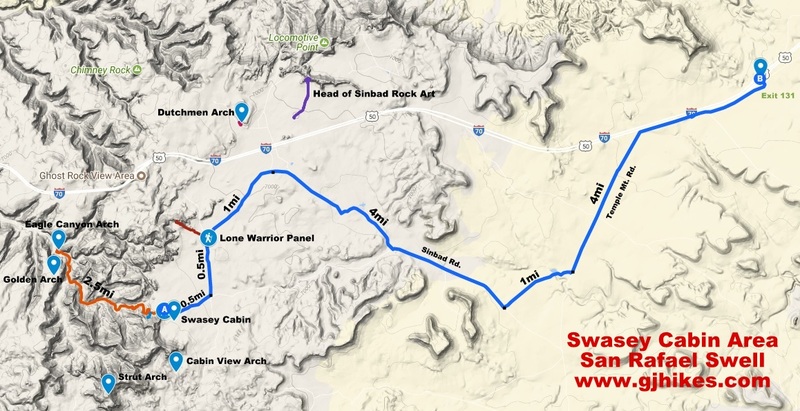 Many of the local names in the San Rafael Swell area such as Black Dragon and Sinbad share their names with geological members of the Moenkopi Formation. The Sinbad member is a layer of limestone that was deposited under shallow marine conditions during the Triassic Age. Dutchmens Arch is only about a quarter mile north of Interstate 70 but to get there you have to take a round about route. Travel west from Green River, Utah on I-70 and take exit 131 the Temple Mountain Road. The Temple Mountain Road heads south under the interstate at this point. The road to the north is the Cottonwood Wash Road which leads to the famous Buckskin Wash rock art site. Follow the Temple Mountain Road for about 5 miles, turn right and go for about 1 more mile to a 'T' intersection, turn right again and drive for another 3.4 miles, turn right and follow the road as it passes through a viaduct under the interstate. The viaduct has a cement bottom. When we went through it was holding about 5 inches of water from a rain storm the night before. The road splits after you pass under the interstate. Follow the left fork about a half mile to Dutchmens Arch. The right fork leads the the Head of Sinbad Rock Art site. The Head of Sinbad area is popular with OHV enthusiasts. Primitive camping spots are available anywhere in the area that isn't posted otherwise. Campers should bring a firepan and portable toilet. We noticed plenty of fire rings on the ground though but firewood is scarce in the area so if you are planning on having a fire bring some wood also. If you do camp in the area it would be polite to not camp too close to the arch so other visitors don't feel like they are intruding into your camp and so you don't feel like they are either. You can park on either side of the arch. Whichever side you park on you can either walk around the arch or through it to see the other side. You could even walk right over the top of it. Kids will enjoy playing around the arch and climbing on the slickrock. Something to keep your eye out for when driving through the Sinbad Country are wild burros. These equines are descended from burros that strayed off from travelers on the Old Spanish Trail and have roamed freely and thrived in the area for the last 150+ years. The burros can get pretty jittery so you will have to stay a good hundred yards away to keep from spooking them. Dutchmens Arch is only one of many other attractions in the San Rafael Swell area. There is a nice Barrier Canyon style pictograph panel about a mile away. On the other side of the interstate you can find the Swasey Cabin and another arch not too far from there. If you would like to see it for yourself then all you have to do is 'Take a hike'.